In the American civil rights movement, Rosa Parks and Martin Luther King were among those who set the moral tone. They were champions of non-violence who believed in civil disobedience to generate change by casting light on unjust laws. If Saturday's fundraising dinner for the group American Muslims for Palestine (AMP) is any indication, role models for their cause include an unrepentant killer, a woman directly responsible for two people's deaths in a grocery store bombing. Prosecutors say she is in America only because she kept that crime a secret from immigration officials. 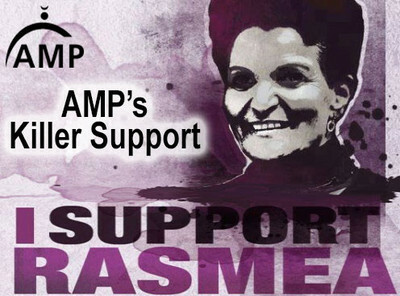 In addition to its praise for Rasmieh Odeh, the dinner at a banquet hall outside of Chicago offered further insight into AMP's radical ideology. Other speakers included a man identified as a Muslim Brotherhood leader in Jordan who previously led a Hamas-propaganda arm in America and a man listed as a member of the Palestine Committee, the Muslim Brotherhood's umbrella organization of American-based Hamas-support groups. And it is especially relevant if claims that AMP is working with the U.S. Department of Education and is developing a curriculum about the Palestinian cause for high school students prove to be true. While AMP members have a right to their beliefs, public officials should be wary of the group's consistent support for terrorists. As we reported previously, AMP does not advocate for a peaceful solution to the Israeli-Palestinian conflict. Rather, it openly endorses "resistance," a euphemism for violence, and speakers demand rejecting Israel's legitimacy. It is in that context that Odeh received a hero's welcome. She was singled out as "a great community member, a great member for the Palestinian cause" by master of ceremonies Rami Bleibel. Odeh was indicted in October and charged with naturalization fraud. She failed to disclose her arrest, and 10 years in an Israeli prison, for her role in 1969 bombings by the Popular Front for the Liberation of Palestine. Two people were killed when one of the bombs went off in a grocery store. The case is "politically motivated and its intent is to hurt the active Palestinian solidarity movement and to hurt all strong Palestinian activists that are standing up for the just cause of Palestine," said Bleibel, AMP's chapter coordinator. Speaking for AMP, he said that "Rasmieh's case is our case, as activists for this just cause of Palestine and supporters of human rights and supporters of justice for all over the world." Politically motivated. That's the standard Islamist reply to virtually all prosecutions of terrorists and their supporters. It has been trotted out to minimize the conviction of five men in a Hamas-financing trial – the largest terror finance trial in U.S. history. It continues to be invoked in the case of a former Palestinian Islamic Jihad board member. And now, prosecuting a terrorist who lied on her applications to get into this country and obtain citizenship is politically motivated. "We will not be intimidated," Bleibel said Saturday evening about Odeh. "We will continue to work day-in, day-out, night and day, to serve this beloved cause, until we see a free Palestine. 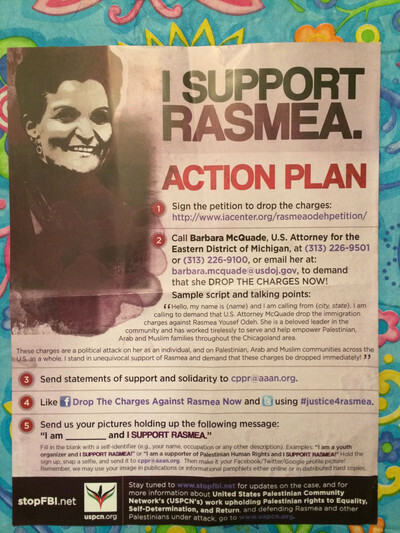 I want to take this moment to ask all of you to get up, stand up, and give Rasmieh Odeh a round of applause and to applause to show the community is behind her and we will continue to support her." The bombing was never mentioned. Odeh received several ovations. Flyers available at the dinner urged supporters to sign a petition and call Illinois U.S. Attorney Barbara McQuade, "to demand that she DROP THE CHARGES NOW!" It's a message consistent with previous AMP gatherings, including a 2011 conference which cast Palestinians convicted on terror-related charges in America as heroes. The AMP is no fringe outlier among Islamist groups. It is a founding member of the new U.S. Council of Muslim Organizations, joining the Council on American-Islamic Relations (CAIR), the Muslim American Society (MAS) and the Islamic Circle of North America (ICNA). Internal documents place CAIR on the Muslim Brotherhood's Palestine Committee, and, in 2008, the FBI cut off non-investigative interaction with the group over lingering questions of whether its leaders have ties to Hamas. MAS was formed by Muslim Brotherhood members in the United States as the group's branch here. ICNA's curriculum features Islamist authors like Sayyid Abu 'Ala Maududi, and its charter calls for the "establishment of the Islamic system of life" in the world, including in politics. Its handbook urges "striving to make this Deen [religion] a way of life for all." AMP Media Director Kristin Szremski later introduced a video showing some of AMP's work. The group is working with the Department of Education, she said, "to protect free speech on college campuses." That's an apparent reference to Northeastern University's attempt to suspend Students for Justice in Palestine, an AMP affiliate, for vandalism and violations of other policies during anti-Israel programs. The video described "thousands" of workshops that AMP has had with Muslim high school students who "don't connect with their Islamic heritage in the Holy Land." AMP plans to develop a Palestinian curriculum "that will fit seamlessly into high school social studies or history lesson plans." It also hopes to generate a policy paper aimed at persuading Congress to cut off aid to Israel. Earlier, the audience heard from Sabri Samirah, introduced as "a longtime global and national Palestinian activist." Samirah spent years fighting government attempts to bar his return to the United States after a trip to Jordan because of visa issues. The case was punishment for his work on the Palestinian issue, he said. None of that was mentioned in his court fight, but Samirah does have numerous connections that should prompt concern among U.S. immigration officials. During a 2011 appearance on Al-Jazeerah, for example, Samirah was introduced as "a political analyst and leading member of the Muslim Brotherhood in Jordan." And before he left the U.S., Samirah served as chairman of the Islamic Association for Palestine (IAP), a propaganda arm for Hamas and a cog in the Muslim Brotherhood's Palestine Committee, court records show. During his tenure as chairman, the IAP's annual conference had the uncompromising title, "All Palestine is Sacred." The evening's fundraising was led by another man with Palestine Committee ties. Jamal Said is included in the prosecution's list of unindicted co-conspirators in a section for Palestine Committee members. He also is listed in an internal Palestine Committee telephone list. Keynote speaker Salman Abu Sitta, meanwhile, offered hyperbolic rhetoric about Palestinian suffering that ignored 20th century history. The creation of Israel, what Palestinians call Al Nakba, or the catastrophe, "is the largest ethnic cleansing operation in modern history," he said, "and is the most comprehensive ethnic operation, cleansing operation, in modern history. It is also the continuous ethnic cleaning operation. There is nothing like it. In Palestine's 5,000 year history there is nothing like it." It should go without saying that the German Holocaust, aimed at eliminating European Jewry, ended up with 6 million Jewish dead. In Bosnia, officials tried to rid the country of Muslims and Croats. In 1994, 800,000 Rwandans were killed as the dominant Hutu population tried to eliminate the Tutsi minority. And, it bears mentioning that a nation trying to ethnically cleanse itself of a minority population would not ensure voting rights and parliamentary representation for that minority. Sitta's absolute statement fits right in with AMP's message. The organization has no interest in compromise or peaceful co-existence. Its ambition is a Palestinian state replacing Israel. The group's true message must not be forgotten when schools, especially if any public schools, are approached by AMP representatives offering their version of a curriculum on the Palestinian issue. She is a killer and liar with support from CAIR and we are supposed to let that go?? If she cannot be honest and has ties to bombings there is no way for us to know she has changed and therefore should not allow her to stay in the USA. When these people value LIFE over death there will be PEACE. And not one moment beforehand. But first, they have to stop lying about it. I will ask one question, why are these people allowed inside the United States? These people are terrorists. The FBI must know this but they are doing nothing about it, why is that? Don't anyone remember 9/11? I remember the article in the newspaper about the Middle Eastern kids in a class room that had windows that looked out at the twin towers that had all brought their cameras to school, the teacher asked why and one kid piped up that after today the towers wouldn't be there anymore. All of these kids heard this at home and at the Mosque they attend so it was well known what was going to happen yet not one Muslim came forward and told law enforcement about what was going on. The FBI was supposed to have investigated this but I never saw anymore about it in any newspaper. This group of Muslims are here for one reason and that's to raise money for the terrorists that want Israel wiped off the map. I do believe we have one of the most naive governments in history with these people pulling at the bit to be allowed inside our schools. This is what has happened to Europe the Muslims want to take over because of their numbers.